Do you need a loft conversion in Epping? If so, then our professional loft conversion team can help. Our services reach out to customers throughout the whole Essex region. If you have outgrown your home, you are probably faced with two choices, extend or move. Usually extending your home is the most cost effective one, especially extending upwards via a loft conversion. We cover all aspects of a loft conversion project, from planning to completion. To find out more about our loft conversion service, click here. Loft conversions make clever use of your loft space, providing you with extra space to use for rooms, bathrooms, or anything else you want. You can work with your architect to add certain features into the build. 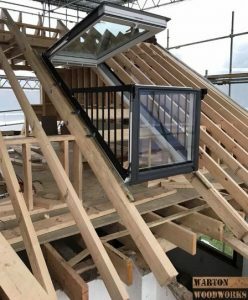 For example you could add a luxurious cabrio Velux balcony window like the one below. You can read more about these types of windows here. Conversions add value to your property. Your home after a loft conversion usually increases in value above the cost to build it. Loft conversions are typically a cheaper idea then moving to a larger home to get the amount of space you desire. Interested in a Loft Conversion in Epping?